So there I was standing in the lavatory. A posh lavatory, I hasten to add. And not one anyone was using at the time. Have you noticed that pub toilets often have excellent reading material on the walls? Whilst I was not standing in a pub toilet, this room had been furnished by the daughter of a brewer. And she knew great toilet wall material. We remain for a second day within the lavish, comfortable walls of Polesden Lacey, a gracious weekend house in Surrey which was owned by great friend of Queen Mary, Margaret Greville. Indeed the Queen Mother may well have used the Portico Toilet at some point during her honeymoon stay. Once I had walked in I could not leave. I looked around after three minutes or so to find a small queue of polite tourists waiting for me to leave because,when all is said and done, this is still the littlest room in the house, and for them to get in I must step aside. But I could not leave. 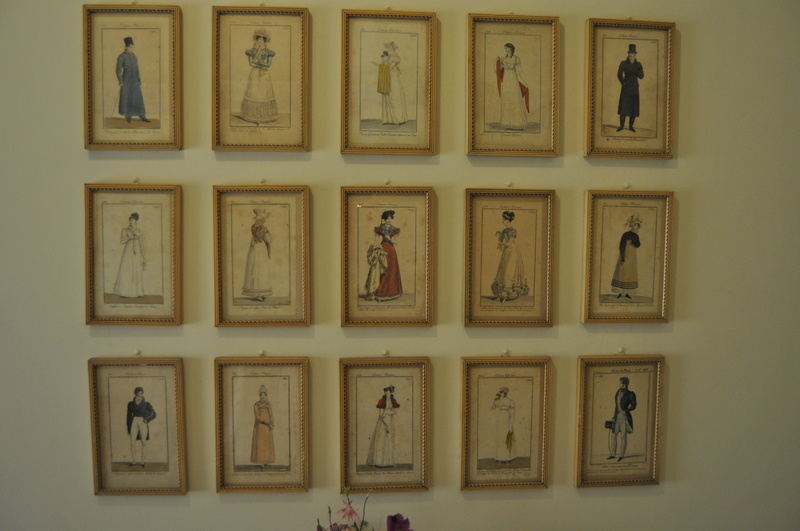 I was riveted by a series of small framed pictures on both walls. And not frocks contemporary with the heyday of the house, in the early part of the 20th century. Frocks which came from the time of Jane Austen. They are from the pages of Costumes Parisiens, a French fashion magazine which emerged in 1797 when Napoleon and his consort Josephine came to power and the harsh conditions of the French Revolution – and their influence in what women could wear – were relaxed. It was a brief Summer of fashion publishing – the magazine closed in 1836. The pictures you see today come from an 1809 edition. The women of Jane Austen’s time would have coveted the Paris fashions. The Misses Bingley and Darcy would have dressed in nothing less, I feel sure. I could not leave without taking copious pictures, and I leave them here for you to peruse. Even the Mr Darcy ones. Posted in Places to visit, Quirks of HistoryTagged dresses, fashion, fashion history, frocks, Jane Austen, ParisBookmark the permalink. What an interesting collection of pictures! Thanks for sharing what I wouldn’t have been able to see if I had been there :-). and that hat 3 rows down on the left!! looks damn heavy!! Gives one lots of ideas for decorating the smallest room in the house. The most intriguing I’ve ever seen had its walls completely covered in decoupaged covers from the Saturday Evening Post. Crikey, I thought at first, I missed that in P&P; Darcy a cross-dresser. Wow. Then I reread it and understood. I almost want to stay with my first impression. What sophisticated lavatory decor. I only have a framed Roz Chast cartoon in mine. Its been far too long since I visited there. Thanks for the reminder! Sounds like a lovely place to visit. I would have whipped my own camera out, asap, and taken photos as well, Kate (though they would not have been as nice as yours). What fun you had in this house on a rainy day. I’m sure Henry Tilney in Northanger Abbey would have had something to say about the fashions. Remarkably well-informed about fabrics for a clergyman, he must have been the Gok Wan of the early 19th century. Strange that in those days ladies had their waists just below their bosoms! I would have been in there for a really long time looking at all the drawings. I love Georgian and Victorian fashions. Thank you for taking the time to photograph all of them so that we don’t all have to go over to Polesden Lacey to use the toilet.